When it's time to change your tires, you want to have them done by someone who has the proper tools to ensure they stay on and are properly balanced for your safety. Rather than try doing it yourself, why not take your car in to the professionals at Gustafson's Kia. Our factory trained technicians will have your tires changed in Prince George and get you back on the road driving safely in the winter weather in no time. 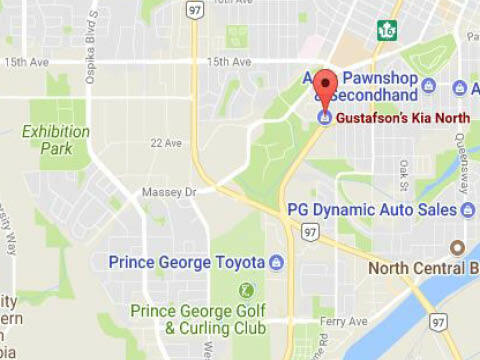 If you're looking for a quick and easy tire change in Prince George, bring your vehicle over to Gustafson's Kia. Our service department provides fast and friendly service at reasonable rates. While you're here, you might also consider getting a tune up to ensure your vehicle is performing at it's best before winter driving conditions set in. Visit us at 112 North Broadway, Williams Lake, BC or call 250-392-2305 to book your tire change today. When you come in to Gustafson's Kia, you become part of the family. Whether you're here to buy a new vehicle, getting your vehicle serviced, or just having winter tires put on, we want you to experience the best service possible. We are always looking for ways to serve you better, so let us know if there's anything we can do for you while you are here. At Gustafson's Kia, we make everything easy. Book your next appointment for a tire change today! Our factory trained service technicians are specially qualified for servicing all Kia makes and models. When you book your service appointment with Gustafson's Kia we guarantee you'll have your vehicle returned to you running smoothly and at top notch performance as it did the day you first bought it. Let us take care of you and your vehicle when you bring your Kia vehicle in for a service at Gustafson's Kia. When you need the right part for your vehicle, it can get confusing having to search by yourself. Come to the experts at Gustafson's Kia. We have a wide array of genuine OEM parts that are perfect for your Kia vehicle to keep it running in top condition for years to come. You can order the part online using our convenient parts and accessories form on our website. We will find it and have it ready for you in a timely manner. At Gustafson's Kia, we want you to feel comfortable when dealing with us. If you prefer to interact online, we make it easy with our easy to navigate website. You can browse our inventory, book a test drive, schedule a service appointment and more all from the comfort of your own home or wherever you have a Wi-Fi connection. Have questions? Give us a call or contact us with our online contact form and we will get back to you shortly.